Spring has arrived in the Northwest corner finally and we are all enjoying the weather. 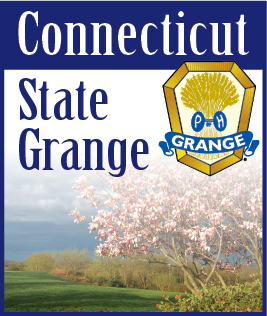 As we look forward to June do not forget the Grange Sunday service with the Lecturer's program on June 13th starting at 11:00 A.M. This month we will consider three steps to take charge of our lives. The expression "seize the day" is wonderful but the truth is many of us do not know how to seize the moment. If we do not take charge of our lives, someone else will and if we do not have a purpose in life, we end up going whatever way the wind is blowing the strongest. So how can we take charge of our lives? The first step is to leave home. I am not referring to a teen leaving home. I am referring to leaving the conditioning of our childhood. As adults, we continue to act and react in ways that reflect what we saw or did as children, even when we do not want to. If we haven't done any self-development, we may be using the same interpretive lens we have used as a child to explain what is going on around us. We are all born with a particular legacy. In addition to our genetic structure, we inherited certain beliefs and ways of being in the world. The parts of our legacy which serve us well we can embrace and keep. The parts which do not serve us well, we can release and replace it with something more useful or appropriate. The second step is go get with God. Learning to commune with God, listening to the still small voice within and growing spiritually are not things we wait to do. God should come first and as we attune ourselves to the Devine, we find the time and energy to do what is ours to do. God can help us take charge of our live. God created us to be insightful, capable, resilient individuals. Remember "that they that wait on the Lord renew their strength, they shall run and not be weary." When we get with God we find meaning and purpose. Step three, throw your hat over the fence, stepping out in faith. When we make a bold move and put ourselves in an irreversible position, it motivates us to throw that hat over the fence and view things from a different perspective. It may mean that we need to close one door and open another. It may mean we need to be flexible and make adjustments or stand firm. Typically it will mean taking a risk. Change happens when the thoughts become aspirations we act on. The process of change has its beginning in the mind, with an idea and then it must advance to the heart where our emotions reside. We must experience it on the feeling level before it becomes reality. Seize the moment, seize the day, seize your life and take charge!